Unusually I’ve included two guitars in this featured build. The reason being that both were built very close to each other to experiment with, among other things, using regular 6-a-side tuners on a curved sided headstock. Both guitars were straight forward builds. The electric 12 came first as I had a pair of TV Jones pickups and wanted to try them with push/push pots for series/parallel switching (TV Jones do not recommend coil cuts). I wanted a subtle tone change that I thought this switching would bring. Also I wanted to try a satin finish on the neck, even though it was to be over a surf green paint job. The acoustic was to feature the same scale length, zero fret and radius again with satin to the neck, although over uncoloured mahogany. I also wanted to add a JDL bridge truss system that I’ve been using on some of my pickup equipped acoustic guitars. Again the build was quite straight forward and I wanted to use some more Torrefied spruce for the top and top bracing. The Fishman pickup set up is really good but I have used many of them before so no surprises there. Both guitars are very satisfying. The electric with its series/parallel switching is very subtle and I really like it. The satin to the neck is, to me, less successful, it just doesn't seem "right" somehow but on the acoustic it does. the 6-a-side tuners work perfectly with the curved headstock sides so all in all I am very pleased with both guitars and as they were not custom orders, both are offered for sale elsewhere on my site. 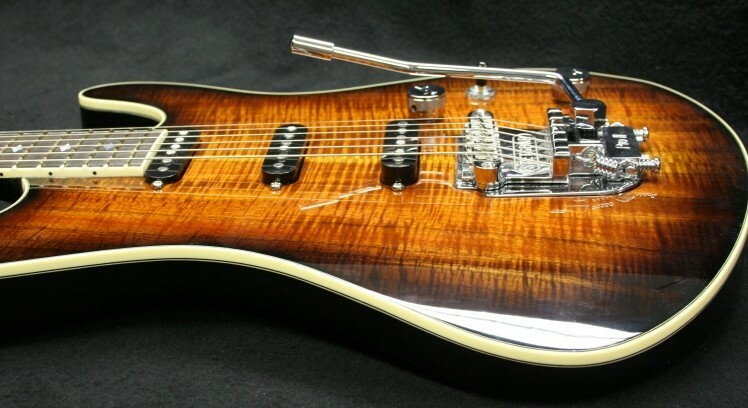 Doug Morter Signature Electric At last! This is one that I have wanted to build for about 40 years! Doug Morter singer, song writer, guitarist, one of the founder members of Hunter Muskett and most importantly a good friend. Since Muskett has been back together, after about a forty year gap, Doug has borrowed a couple of my guitars for live gigs but recorded with his trusty Strat. So an "S" type guitar it would be. I showed Doug a picture of a recent carved top electric and thought it would make a good 'drop top'. A vibrato was essential and knowing Doug's preferences in sounds and pickup combinations we decided on three Kinman noiseless Hank Marvin Gypsy Jazz pickups. It was to be a custom set without logos and more importantly with base plates made the same size as the pickup covers so that the pickups could be fitted from the front of the guitar and not into those large routs that you too often see on 'metal' guitars. The pickups came but at a huge price! Still they were what I'd ordered. Watching Doug play his Strat it was clear that a light action vibrato was needed so we went for the Stetsbar. I've fitted a few of these and they always impress with their range and tuning stability. 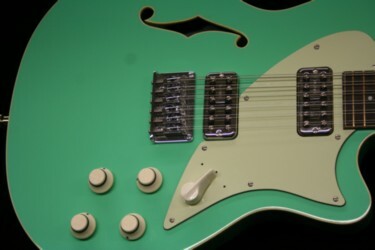 The model chosen was one that was designed to be retro fitted on a Strat. I thought the baseplate shape suited that guitar although I did add two more screwholes (hidden by the springs) and I recessed the plate into the body to keep the saddle heights as low as possible. 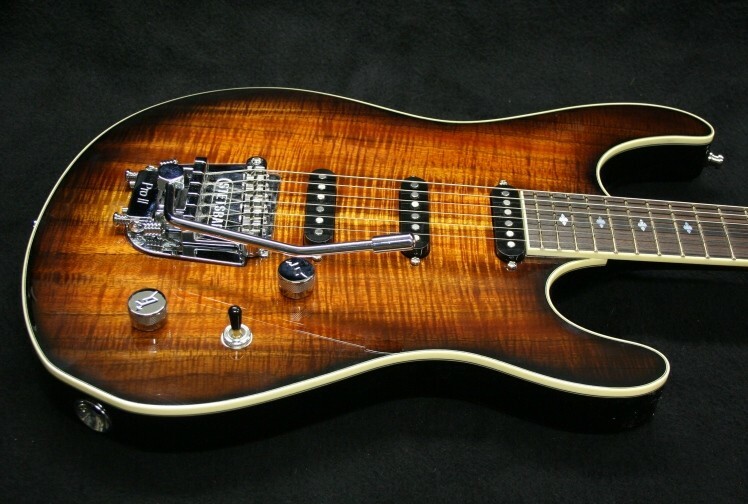 We chose swamp ask for the body with a stunning book-matched koa top. The top is abount 5.5 mm thick and so it needed to be pre-bent to fit over an exact carve on the ash body. I'd already made a couple of jigs for previous builds to facilitate these curves and so it was a tried and tested method. The Ash body was also chambered for further lightness and resonance - Doug is not a loud player so feedback isn't an issue. Once the body was full routed and chambered, all pickup cavities and the control cavity were lined with copper foil running to a common earth point. This was done before the top was glued onto the body. A few 'dry runs' were carried out making sure that the pickups could be fitted into the enclosed body. Originally I was going for a standard five way with a' la Strat but with position three wired to give neck and bridge pickup rather than the standard middle pickup only as Doug favours the slight phased sounds of two pickups together (Knopfler etc) However I stumbled on the Freeway switch which looks like a simple three way toggle but operates in two plans giving six combinations. I noticed that it was designed in Britain so I contacted the web site and was put in touch with it's designer Alasdair Bryce. I told him exactly which combinations that I required and the currently available switch didn't quite give what I wanted but Alasdair said he had a Freeway Ultra switch which would do exactly what I wanted which was Switch in downward position giving Neck only, Middle only and Bridge only, like an early Strat but with the switch in the up position we get Neck and Middle, Neck and Bridge, Middle and Bridge. I have never seen the need for all three together. Alasdair went the extra mile and wired the switch with flying leads in my colour designations to make my life easier. Isn't it nice when things like this happen! The only other electric were a Volume and a Tone control but I did wire into the control cavity a mini switch that could add a treble bleed resistor/capacitor if needed. 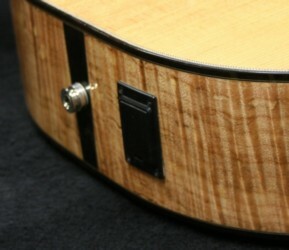 A scale length of 25" was decided on and the macassar ebony fingerboard given a 12" radius. M.o.P. 'snowflake' markers were inlaid and an SLR nut fitted. 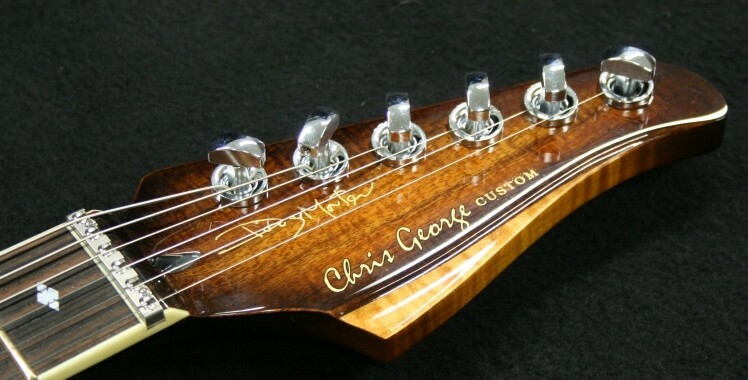 To keep things special I used Steinburger gearless tuners, which act like fine tuners and look very good on the headstock shape especially with a koa headfacing and Doug's signature transfer in gold. The guitar was finished in tobacco burst nitrocellulose. Being of a certain age, I have acquired many old guitar parts, one such part being a Bigsby vibrato unit, originally used on a now defunct twin neck electric. 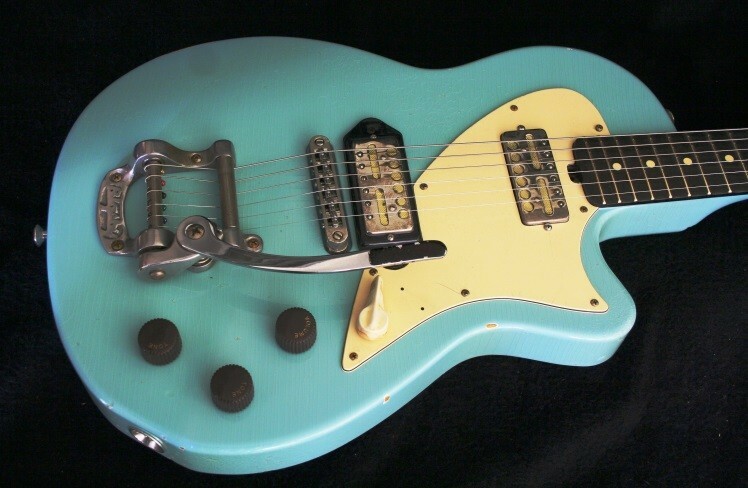 Being a Bigsby fan (sorry you dive bombers out there) I thought it would be rather fun to build an "aged" guitar. Now I know this is very trendy and 'in' at the moment and nobody could ever accuse me of being either of those, I decided that I had to work this out of my system. I'd previously made a Variax equipped electric to a shape supplied to me by a customer. To be honest I was not that enthused with the shape but the guitar came back to me, as the electronics were no longer supported by Line 6 and was asked to convert it to a twin humbucking guitar. This I did, using the superb Lollar El Rayo pickups, and visually and sonically the guitar was transformed. The shape suited real pickups, the finish was suitably worn in and it looked kind of retro. (It turned out that the shape was copied from one of Tom Anderson's models-this has only recently come to my knowledge-sorry Tom). I decided to base my "aged" guitar on this and try to capture some sixties vibe along the way. I wanted some pickups that had single coil tonality but weren't Fender style and I chose Lollar Gold foils, as I love all Lollar's pickups and know their quality. The switch was to be the very traditional 3 way and I used a repro of an early Kay lever switch. One volume and two tone controls were capped with similarly old style radio knobs. Although I knew that there would have to be a certain amount of 'distressing,' I never thought it would be quite so painful. I visited my local "vintage and Rare' shop (Top Hat in Horncastle Lincolnshire) to see some genuine ware and was very surprised to see that most instruments were in fine fettle and Norman(the shop owner) said "Guitars cost a lot of money in the sixties and folk looked after them." I was glad of the visit, as it stopped me from going overboard. Having said that, with the guitar strapped on I wore a belt with nasty buckle, I walked into doorways, I stood it against walls and 'accidentally' knocked it against furniture. I could have wept but I had to stick to the plan. The culmination was ageing all the nickel hardware using vinegar vapour and putting the lacquered woodwork into chest freezer for one hour twenty minutes. Then I did weep!